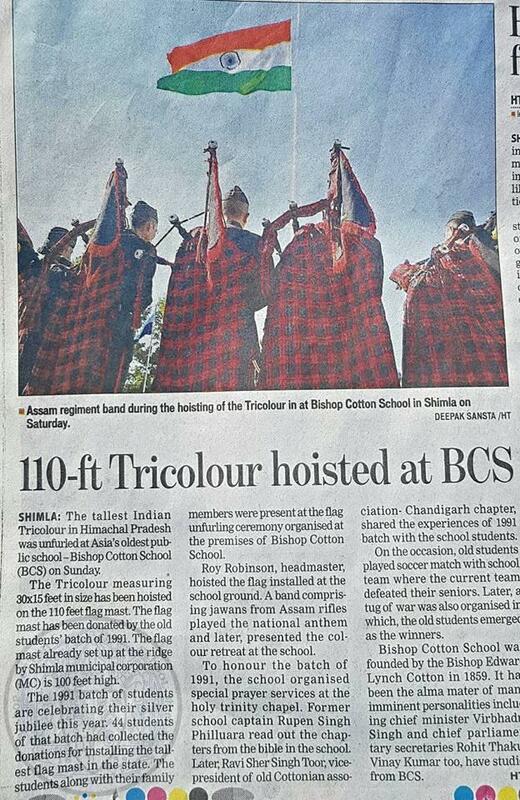 The Batch of 1991 celebrated 25 years of graduating from Bishop Cotton School, and installed the tallest flag pole in all of Himachal Pradesh – 110 feet – with the Head Master Roy Robinson hoisting a massive 30’x15′ Tricolour. A band consisting of Jawans of the Assam Rifles played the Indian National Anthem and presented colors. This entry was posted in Events, News, Post and tagged 1991 Batch, BCS, Celebration, Networking OCs, Roy Robinson on October 23, 2016 by admin. The matter relating to visits of OCs to the school was discussed with the Headmaster and he was informed of the apprehensions expressed by some members of being shut out of the campus and not being allowed to visit their Alma Mater. Mr Robinson assured me that the old boys are always welcome to visit the school but the entry of visitors has to be balanced with the need to avoid disturbance of school routines and the present day security issues ( regarding which he has received a communication from state authorities). Hence, OCs are advised to call and seek permission before visiting the school and, if this was not possible, to wait awhile at the gate while the security gets a clearance from the Headmaster/Senior Master. In addition, he assured me that they can visit anytime from 3pm to 5pm on weekdays and through out the day on Sundays when classes are not in session. It must be understood that students do get disturbed when classes are in session and visitors are seen on the first flat. I would also like to request the Chapter Heads to issue some sort of ID cards for OCs as this would make it easier to distinguish them from other visitors and meet the needs of security. They must also maintain proper decorum on their visits and not create any disturbance as, by doing so, they shall set an example for the school kids to emulate. This entry was posted in Post and tagged BCS, BM Singh, Important information, OCA, Roy Robinson on October 1, 2013 by admin.